Scott Pye has revealed he was forced to overcome blinding lights from his dashboard on his way to claiming a maiden Supercars victory at Albert Park. 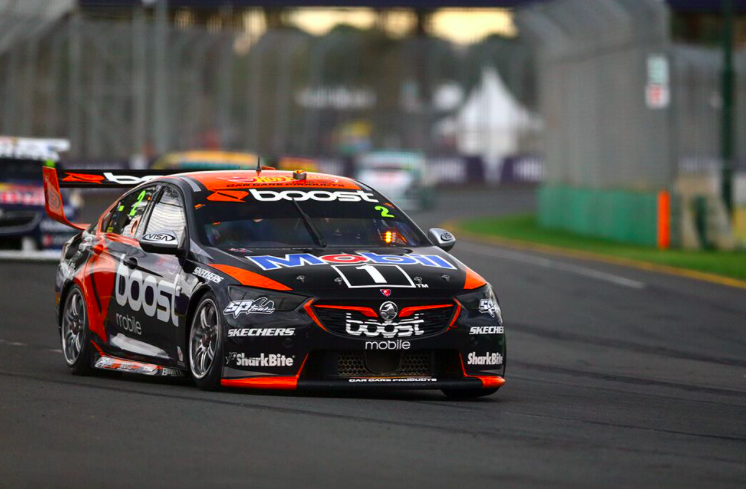 The Walkinshaw Andretti United driver produced a fine drive that included adapting to tricky wet conditions on slicks in fading light to hold off Triple Eight’s Jamie Whincup for a memorable win. Pye elected to stay out and battle wet conditions rather than duck into the pits for wets when rain intensified for the final eight laps . However, the decreasing dusk light provided an extra challenge, with Pye blinded by his dashboard lights and unable to lower the brightness. He admitted the issue seriously affected his visibility while navigating the slippery circuit in the closing stages. “It was dark but my biggest problem was that I couldn’t remember which button turned my dash down, so the lights on my dash were on full brightness, so if you can imagine a car driving towards you with their headlights on, that’s what it was like,” said Pye when asked about the fading light by Speedcafe.com. “When I was looking out my window, I couldn’t see the lines (and) I struggled to see kerbs. “I wanted to ask Starry (engineer Rob Starr) which button, but there was enough going on, so I just kept my eyes forward, looked in the mirrors as little as possible, and just pressed on, but certainly it was dark but it was good to keep going. It wasn’t the only moment of drama for Pye as he thought he’d lost victory when he ran onto the escape road at Turn 13 on Lap 23 after locking his rear brakes. “It was (nerve-wracking). It was a real shame it rained actually; I was so comfortable in the dry, the car was really fast, and then that rain came,” he added. “I made a brake bias change going up to Turn 13 and as soon as I got on the brake pedal I just locked the rears, engine went silent, and I went off the circuit onto the escape road. “I turned it around, and nailed the gas because I knew Whincup would be there somewhere, so (I was) really lucky to hang on there. “I thought, at that moment, ‘This could be it, this could cost me the win,’ but as soon as I got back in front it was just a matter of trying to focus straight away, put the car in the right spots to defend. The South Australian’s first Supercars win has come after 165 races in the category since his debut in 2012, while the victory was the first for the new Walkinshaw Andretti United squad.